Jean Louis Steuerman has recorded a considerable amount of Bach (amongst other composers) and includes in his discography the Partitas and Concertos in recordings for Philips. In a book format � for which there is an ISBN and ambiguous release number which I hope I have right � the latest instalment in Steuerman�s Bach odyssey has been recorded for the French company Actes Sud and was taped in London. Steuerman�s Goldberg Variations takes 73 minutes, nearly twice the length of Gould�s 1955 traversal. Principally this is a matter of repeats, of course, but by no means exclusively. There is a deliberation, a considered intensity to Steuerman�s phrasing that can be both concentrated and also, to be frank, off-putting. It would be foolish to underestimate his pianism or the considerable thought and care that has gone toward the recording but having recently listened for review to recordings by Glenn Gould and Craig Sheppard and listening again to Landowska, Hewitt and others my response to Steuerman is very mixed. The Aria is quite slow, speeds up, employing some détaché articulation toward the end. The first Variation emerges as dutiful, never coursing from the Aria, and the second is point making and slow, lacking animation and colouristic differentiation. I found the nasality of the bass sonorities in the third rather unsympathetic and a lugubrious insistence generally whereas in the fourth there�s far too much pecking articulation for comfort. By now it should be clear that Steuerman favours a rather granitic, determinedly unterpsichorean account � the contrast with a musician of a similar generation, such as Sheppard, is striking and their aesthetic imperatives in this work are diametrically oppositional. The Seventh Variation attempts an awkward skittishness but manages only to emerge as rather garbled. The ninth variation is terrifically heavy, entries stodgy, almost parodically so and even when the left hand becomes more animated there is still an audible lumpiness to the phrasing that I find unsympathetic. Considerably better is his playing in the next variations though there are still some question marks about the voicings. I thought I would admire the thirteenth � Steuerman�s touch is frequently beautiful and I wouldn�t want to give the impression that he lacks delicacy and sensitivity; but little over-emphases do beset the line. I wish he had rethought or retaken the Sixteenth Variation; to my ears it sounds simply incoherent. Nineteen is jog trot point-making once more, regrettably, and worse he makes little effort at contrasting this with the succeeding variation. He certainly has the fingers for this but not the clarity of articulation and the variation sounds consequently muddled. Variation 23 is a galumphing affair and stop-start but I sensed a greater power emerge in the succeeding variation at least in terms of direction. As for Landowska�s Black Pearl variation at seven minutes this is long but its length is a relative matter. Much here is delicate and involved and in the main Steuerman improves as the work develops, variation 26 being animated and in 27 there is a greater sense of clarity and bite in the entry points. Variation 28 is let down however by deliberately retarded entries and a conscious slowing undoes momentum. Rather undifferentiated in terms of sound 29 exposes the problems with such an interpretation as this. Little bass note pointing � ostensibly humorous, in practice the opposite � fatally undermines the already wincing tempo and the Quodlibet is stolid and abjures the light. It�s a by no means unexpected consequence of all this perhaps that the Aria da capo � because Steuerman doesn�t this time take the repeats � is brisker than the original statement though his tempo is slower. I should add that the pause between Quodlibet and da capo Aria is far too long and � you won�t necessarily be surprised to read � I found a lack of culminatory transfiguration as the work finished. My feelings about the booklet text � by Hubert Nyssen � are that they offer obfuscation and silliness. 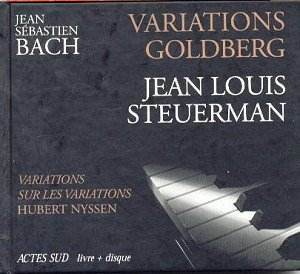 I wish I could be more admiring of Steuerman�s Goldberg Variations; he is a notable musician and others may well like his deliberation and concentratedness more than I. There is assuredly a place for these qualities but also for flight and for dance and I found these in very short supply.